1919. Exhibit at Myreton Motor Museum. 1912 Established by Ronald Charteris in Byfleet, Surrey as a producer of piston engines. 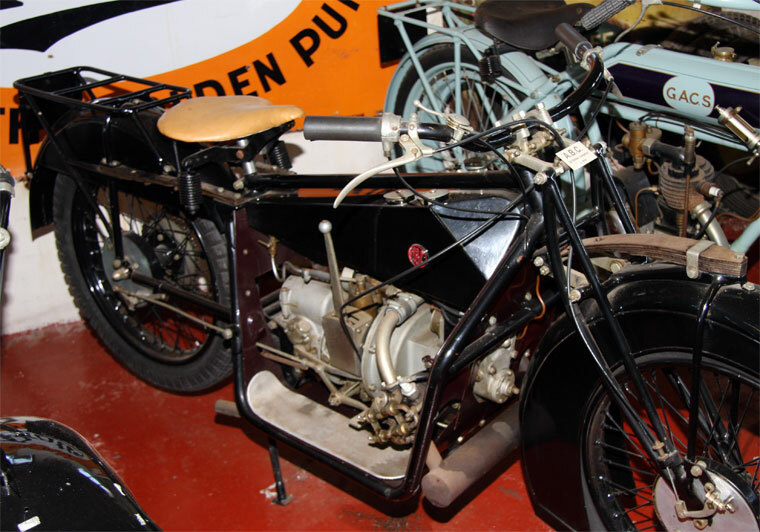 1912 ABC first became involved with the production of motorcycles when their designer Granville Bradshaw was asked to produce some special parts for a 350cc Douglas, owned by Les Bailey. This machine was raced at Brooklands and late that year set a new record. A new flat-twin ohv engine was also produced that year. 1913 A few machines were built, two of which were entered in the TT, but both retired early. 1914 An ABC, ridden by Jack Emerson, set a new 500cc record at Brooklands and a two-model range was launched, both with the flat-twin engine, conventional frames and laminated leaf-spring suspension. The company moved to Hersham, Walton-on-Thames, where they became involved with war work and also produced a few motorcycles. 1915-1916 Those motorcycles built had an ABC four-speed gearbox, gate-change and a sprung frame. 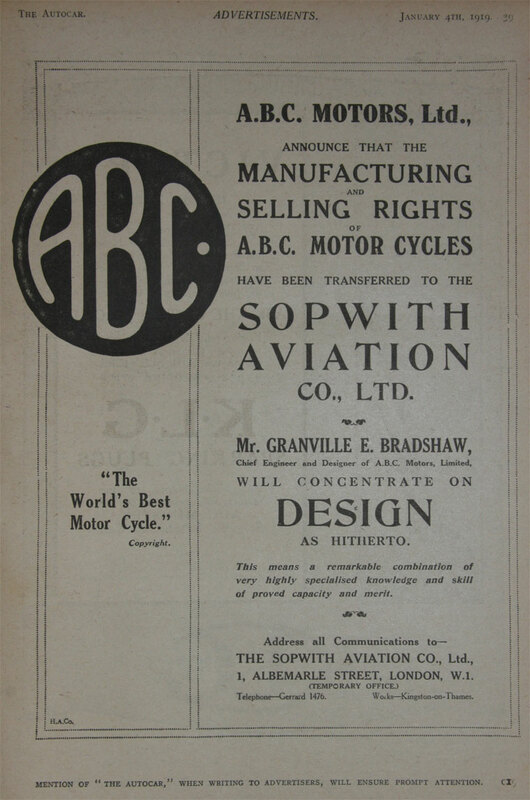 By agreement with Granville Bradshaw, Walton Motors acquired the aeronautical rights to the A.B.C. Aero Engines, including Dragonfly, Wasp and Gnat. ABC Motors owned the majority of shares in Walton Motors. 1919 The motorcycles were built and sold by Sopwith at Kingston-upon-Thames, Surrey. Granville Bradshaw concentrated on the design of what was to be the definitive ABC machine. Sopwith produced the machine in an effort to keep the 3,500 strong workforce employed when the need for aircraft had diminished strongly after the end of the war in 1918. The motorcycle had a 398cc flat-twin transverse ohv engine, a four-speed gate-change gearbox and leaf-spring front and back suspension, internal front and rear expanding brakes and a cradle frame, footboards and leg shields. A kickstarter, however, was seen as surplus to requirements because the machine was easily push-started. It was innovative enough to cause a sensation at the annual Motor Cycle Show, This sophisticated and advanced machine caused the company many headaches. Orders poured in, but the valve gear was troublesome and caused production hold-ups. Production problems caused rising costs, and their initial popularity died. The machine was also very expensive to manufacture. 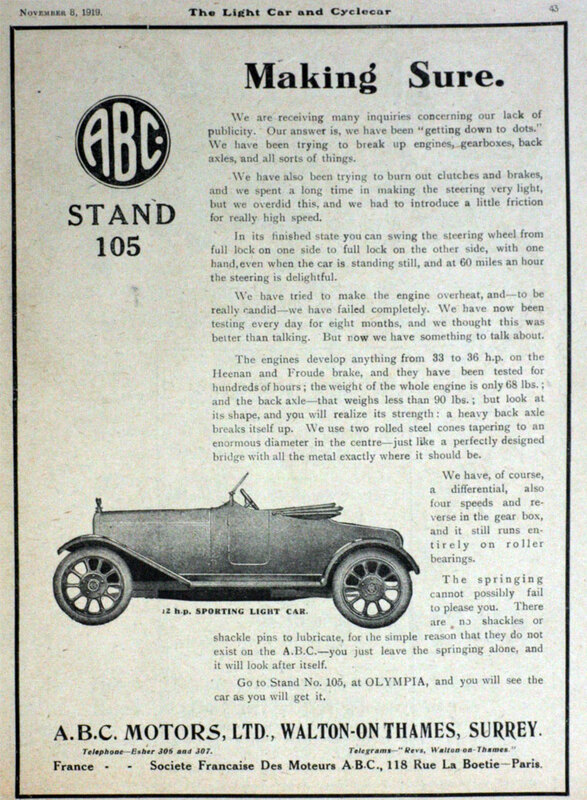 1919 The ABC Skootamota was another Granville Bradshaw design, a scooter, produced in 1919. 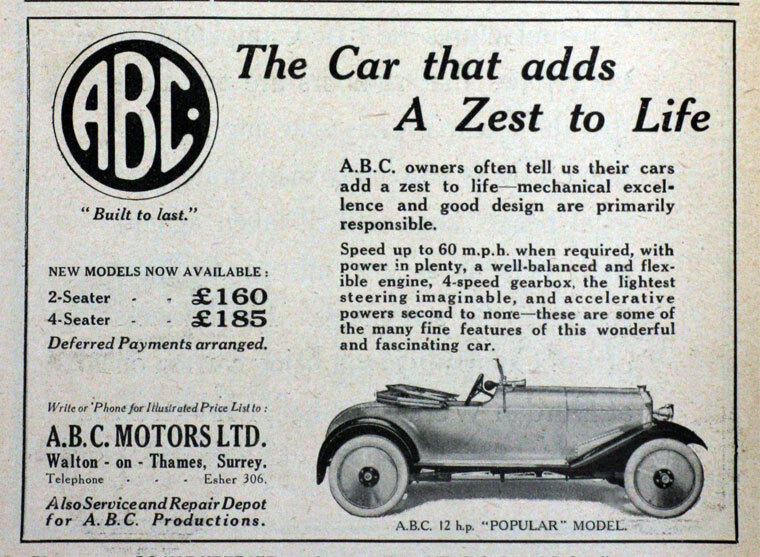 1919 Public company ABC Motors (1920) Ltd floated to acquire as a going concern ABC Motors, manufacturers of A.B.C. 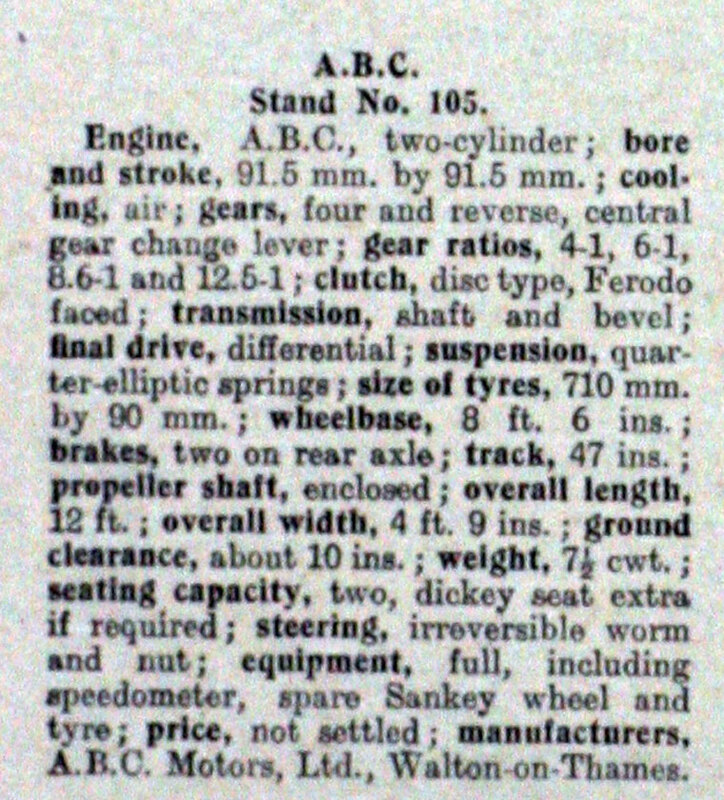 Aero engines, motor cars, motor cycles, motor scooters, carburettors, etc, particularly to increase production of the ABC 2-seater sports car, which Harper Bean had contract to supply the principal materials (castings and forgings) and to sell the production with guaranteed profit. 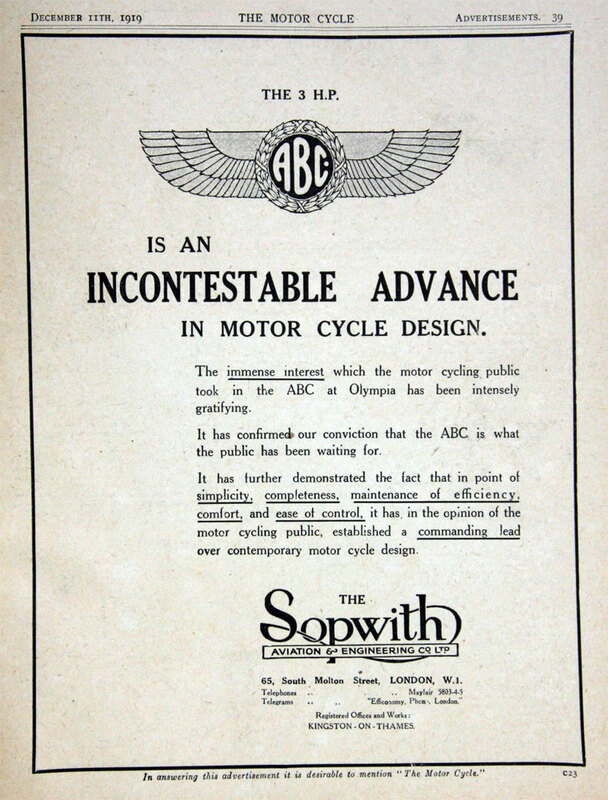 Agreements with Sopwith in relation to ABC motorcycles and Gilbert Campling in relation to ABC scooters for receipt of royalties. This page was last edited on 3 December 2012, at 11:35.